This story is brought to you by Pure Beauty. When K-beauty first started gaining popularity a few years back, I was one of the many who became obsessed with the idea of glass skin. Also known as chok chok, this look is all about a complexion that’s bright, smooth, and glowy! One look at any K-idol is enough to understand why this became such a craze. While you can cheat a little with strategically placed concealer and a lot of highlighter, skincare is the real foundation to this look. You don’t need necessarily need to do a 10-step routine to achieve glass skin but for skin to look extra, some extra effort is needed, too. If you’ve watched get-ready-with-me (GRWM) videos of Korean stars, you’ll notice that most of them start by applying a mask. I prefer the kind that comes in tubes rather sheets since you don’t have to worry about it fitting your face properly or having leftover essence, and the Pure Beauty Urban Shield Recharging Mask (P1,299) offers the additional benefit of strengthening the skin barrier in addition to imparting hydration. Just slather it on, wait for 15 minutes, then wash it off. One of my biggest lessons from K-beauty is applying multiple layers of hydration rather than relying on a single, heavy moisturizer and it has honestly made such a difference to my dry skin! At first, first treatment essences (FTEs) seemed like such an unnecessary step but including them in your routine actually makes everything else you put afterwards work better. Think of it as a primer for the rest of your skincare! The Pure Beauty 95.3% Intense Treatment Essence (P1,499) is very light and water-like, and very quickly absorbed by the skin. It doesn’t leave a tacky feeling so you can proceed with applying the rest of your layers comfortably. I understand that some people tend to skip moisturizer because they don’t want their faces to feel heavy and sticky in this hot weather. But if you want glass skin that’s soft and bouncy, you’re going to need proper hydration. 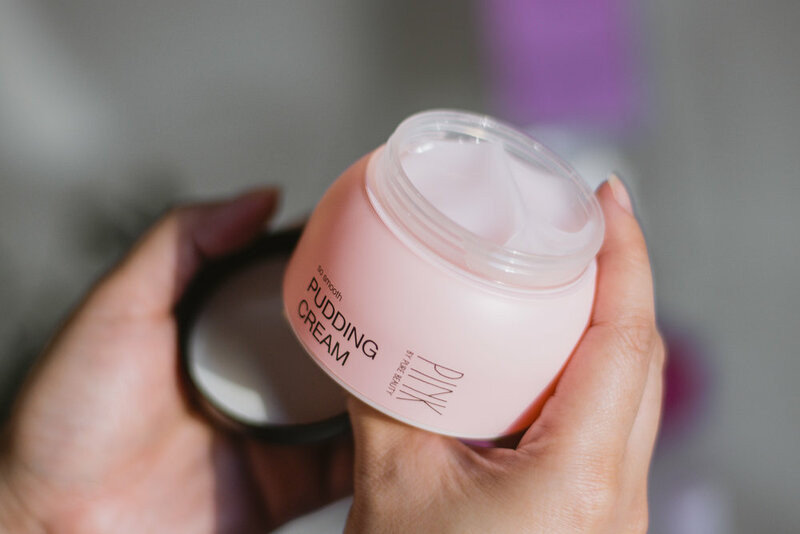 The Pure Beauty So Smooth Pudding Cream (P699) is a lightweight, gel-type moisturizer that applies comfortably on the skin, even for oily skin types. It moisturizes without leaving a greasy residue, and absorbs well into the skin so it doesn’t feel like a heavy layer on the face. What makes glass skin truly elusive is the super smooth, virtually poreless effect. Not even Hollywood celebrities have skin that perfect, but a priming product like the Pure Beauty So Blur Cream (P999) helps to minimize the appearance of imperfect skin texture. It’s not a miracle product that will make wrinkles and large pores magically disappear, but the blur effect creates a soft focus look that makes those flaws less noticeable. Finally, you’ll need a face base with a bit of a dewy finish. 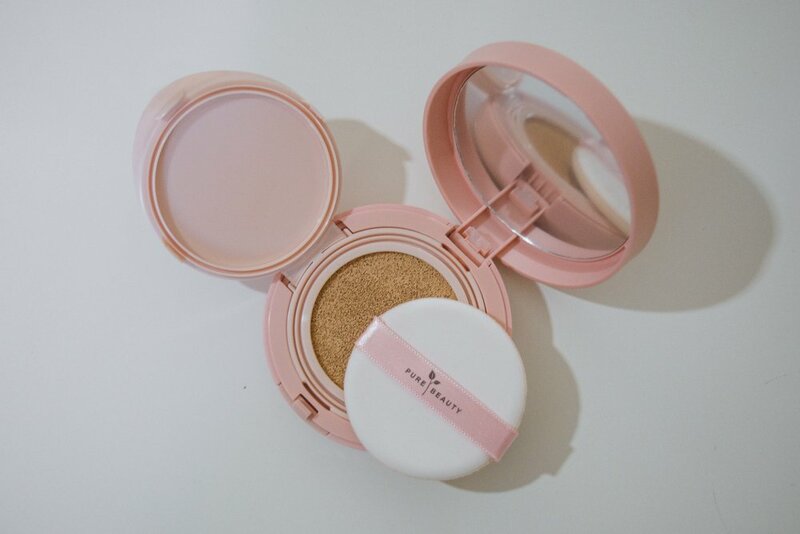 Cushion makeup like the Pure Beauty CC Cushion SPF50 PA+++ (P1,499) offer light to medium coverage with a skin-like finish, and I found this particular formula to have a bit of a tone-up effect that further brightened my complexion. The rubicell puff that accompanies cushion compacts also makes application look more seamless. Tap on a bit of highlighter on your nose and cheekbones, and you’re good to go! Imperfections like acne scars and very dark spots may show through, but following these five steps and being consistent with your skincare will go a long way in helping your skin achieve its best glow. Pure Beauty is available at SM Beauty and Watsons stores. This post is brought to you by Pure Beauty. Three kikay kits, three life situations: Here are a few of the essentials I can't live without!